From January 13 to 15, 2012, the premier German optical trade show thrilled both exhibitors and visitors with business and learning opportunities, along with an evening of fun in the heart of the Bavarian capital. 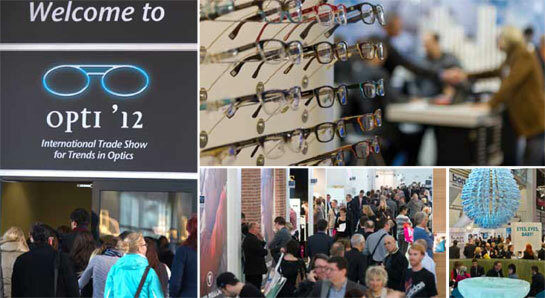 The show, formerly known as opti Munich, is now branded simply ‘opti’ with the current iteration following the name – in this case opti ‘12. Twenty-seven countries from around the globe sent exhibitors to opti ‘12, with products ranging from contact lenses, ophthalmic lenses and optical instruments to technology and retail set-up. As with every opti, several companies launched new creations at the show, including L.A. Eyeworks, Opo Design Sweden and The Norville Group, from Gloucester,England. The show is also eagerly anticipated by buyers, with 23,000 from many countries attending this year. A post-show survey demonstrates opti ‘12’s popularity with buyers. Almost 90 per cent of them rated the show as ‘good to very good’. Visiting retailers were able to take advantage of the chance to learn how to protect their products from shoplifting in a special section of the show reserved for manufacturers and distributors of protective technologies. Relationships between buyers and sellers were strengthened at opti ‘12. Exhibitors surveyed reported higher order numbers than the previous year and increasing interest in their product from buyers from abroad. The overall mood was good and views were upbeat about economic prospects for the coming year. Over half the participants reported their expectations of the future as ‘good to excellent’. This is heartening indeed, especially in light of the troubled euro. The next opti takes place January 25 – 27, 2013 in Munich.